Every so often, this article makes the rounds on social media. The author suggests that horses lick and chew when they are coming down out of a sympathetic nervous system (SNS) or stress response back into parasympathetic nervous system (PNS) relaxation range. The article also equates the SNS with pain, threat, confusion, or fear, which has important implications for equine welfare. Other articles promote a similar view. Although this is certainly true, and while I encourage referring to neuroscience to debunk training myths about what licking and chewing means, it is not the full picture. Thanks to the works of Dr. Stephen Porges (Polyvagal Theory), Dr. Peter Levine (Somatic Experiencing), Dr. Jaak Panksepp (Affective Neuroscience), and countless researchers and other experts, a more modern understanding of mammalian nervous systems is available. Based on these models, the autonomic nervous system actually has 3 branches, not 2. The SNS is indeed the gas pedal (stress arousal, along with survival activation of fight or flight). 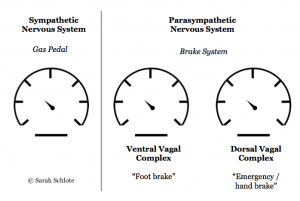 However, the PNS is made up of two different sets of brake systems: the dorsal vagal complex (or DVC), and the ventral vagal complex (or VVC). While the SNS is responsible for mobilization, the DVC is responsible for immobilization (resting and digesting, as well as shutting down in “freeze”). The third branch, the VVC, is responsible for social engagement (dampening fight or flight to be in relationship). Experts now believe that each of these three branches functions like a dial. Each dial fluctuates to different levels along with the others in response to life conditions. This differs from the original 2-branch model, still promoted in equine behaviour articles, that suggested that a stress response and a parasympathetic response cannot occur at the same time. The horse is either in stress (bad) or it is not. However, the reality is more complex, and this creates a host of new possibilities. When the SNS and DVC are on “low”, this supports a state of “rest and digest”, or immobility without fear. This can occur when alone or when sleeping or quietly resting near others (low VVC). It can also occur during quiet bonding, like when nursing an infant or foal, a kitten being carried by the scruff of the neck by its mother, and so on (moderate VVC). An equine example is when a horse lies down willingly next to a human in a relaxed state of connection. When both the SNS and the DVC are on “high”, this is indicative of immobility with fear. In this state, social engagement (VVC) is “low” due to the perception of danger or life threat. An equivalent example would be when a horse is made to lie down out of coercive tactics that involve fear or learned helplessness. The outward behaviour looks the same as the earlier example, but what is going on is quite different. So, enough of the technical stuff. How does that relate to licking and chewing? There are times when the gas pedal can be on without being in pain, fear or confusion. For instance, the SNS is involved in activities that are neutral or enjoyable, like going for a walk, cooking a meal, playing, exercising, and experiencing joy or triumph. The stress response is also involved in excitement, anticipating something pleasurable, engaging in healthy sexuality, and so on. Each of these experiences involves varying amounts of SNS (mobilization) and VVC (social engagement), without a lot of DVC (immobilization). The same is true for horses – horses walk, play, run around, roll on the ground and engage in other activities that involve varying degrees of the stress response without it being somehow negative. Of course, any of these positive or even neutral experiences of the “gas pedal” could become coupled with fear. When that happens, experiences that are neutral or enjoyable for some become unpleasant or intolerable for others. In some cases, this can even trigger fight or flight activation, or a freeze response. Deactivating after the mobilization of survival energy does generate the licking and chewing response animal behaviour articles refer to. But could the lick and chew behaviour occur after coming down from other more positive and pleasurable experiences of SNS/stress arousal as well? There is a difference between stress arousal within a reasonable window of tolerance, and traumatic stress activation that sends the nervous system out of the window of tolerance into hyperarousal (Dr. Daniel Siegel). Not all stress is inherently overwhelming or acute, just as not all pressure is abusive or aversive (such as when having to be assertive to set boundaries with others, with appropriate amounts of pressure and properly timed release). Could licking and chewing signal a shift from the stress to the relaxation response that is well within a horse’s window of tolerance, not just when it is outside of it (in hyper-arousal or hypo-arousal)? The levels of each nervous system “dial” fluctuate and are not static, which is in fact healthy. Fixed states (such as being happy all the time, or anxious or depressed and so on for long periods) are much more problematic. This corresponds with the heart rate variability (HRV) research that finds that greater variability in heart rates is linked with more positive health outcomes across species. Interestingly the heart is one of the organs that is mediated by the polyvagal system. When the brakes are released, the heart speeds up; when the brake are applied, the heart slows down. This can occur by small degrees, sometimes imperceptibly. Do horses lick and chew following some of these more imperceptible and routine fluctuations in SNS arousal? 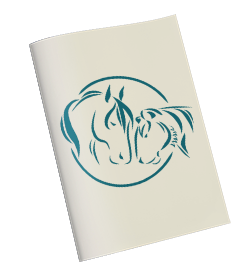 Horses and humans are mammals, and mammals are attachment / herd-oriented creatures that are driven to affiliate. In other words, we are born to “ping” off one another (to quote a trainer of mine, Kathy Kain). Our nervous systems resonate with one another, which is known as entrainment or co-regulation (slightly different but related concepts). This means that by and large we can sense when another nervous system around us is stressed or relaxed and respond accordingly. It is not unusual to feel stressed when others are stressed, or relaxed when others are relaxed. If another horse or a human happens to be stressed and shifts into a relaxation response, could a horse lick and chew as its system syncs and co-regulates along with that external shift in the other? 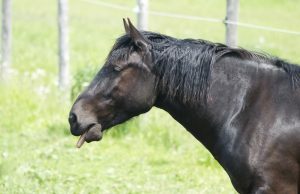 When animal behaviourists discuss licking and chewing, it is often to suggest that the person stop doing whatever led to the horse becoming stressed in the first place. This makes sense when the stress response was outside of the window of tolerance. For instance, Harrison (2016) states “if your horse is performing this behaviour, you should consider whether anything has caused him to be stressed. If you asked him to do too much, startled him, or he has experienced pain or discomfort during training, avoid repeating that in future” (p.59). That is simply the ethical and compassionate thing to do. However, similar to human trauma therapy (such as in Somatic Experiencing), one of the goals of horsemanship and horse “training” is to help grow the animals’ window of tolerance. A wider window does not mean that there would be no stress response, but rather that a horse (or human) has more innate capacity to be with larger amounts of stress without becoming overwhelmed – the definition of resilience. The goal of life is not to avoid stress but to be able to weather it more effectively and recover more quickly. This does not mean condoning abusive tactics to grow the window (which could result in trauma, a ruptured relationship, a pattern of submission or shutdown, and a narrower window), but using approaches that help grow resilience and trust in the human-equine relationship. There is a difference between a horse that has good resilience and is able to remain present in the face of stress, and a horse that is tuned out, dissociated, or complying out of learned helplessness. Does a horse’s licking and chewing necessarily mean that an amount of stress was detrimental? Or could it be that a particular horse has a wider window of stress tolerance and that the amount of stress being experienced is still well within its capacity? Horses can also be observed licking and chewing without a previously aversive stimulus. I have stood quietly with horses at liberty, simply sharing territory, for 10-15 minutes, after which time a few horses began to lick and chew. No aversive training methods were being applied, there was no overt release of pressure, and the horses were on sand and not grazing, but semi-napping. Other times, this has occurred while on grass with calm, relaxed horses just hanging out, but still without active grazing. While salivation also occurs to moisten and lubricate food to facilitate swallowing and digestion, and hypersalivation can occur with certain medical conditions, this was not the case in those moments. Could I have been shifting into a deeper state of relaxation that the horses were responding to? Were the horses’ inner dials fluctuating by small degrees in routine auto-regulation? The horses appeared to be well within their windows of tolerance, putting in question the idea that horses only do this when in fight or flight activation. I have also observed horses lick and chew on many occasions in the context of equine-assisted interventions in response to a shift in a client’s nervous system state. And yet, the horses’ observable body language and behaviour showed them to be calm, curious and interested up until that point. I don’t have all the answers, but I do know these are questions that are worth asking. While paying attention to licking and chewing is important in the context of horse training, it is not the only thing to be monitoring as it alone may not necessarily be a sign of negative stress. What other signs can help understand where the horse is at in the activation cycle or defense response cycle? Are there signs of hyperarousal (e.g., panic, terror, etc.) or hypoarousal (e.g., shutdown, dissociation, submission)? Is the horse connected (in VVC) while experiencing a higher stress (SNS) response? Or are they disconnected while in that state of high stress? What other dials are “on” at the same time? There are more nuances to consider. Further exploration and research of this interesting topic is encouraged.